Oh Deer where are are we?! 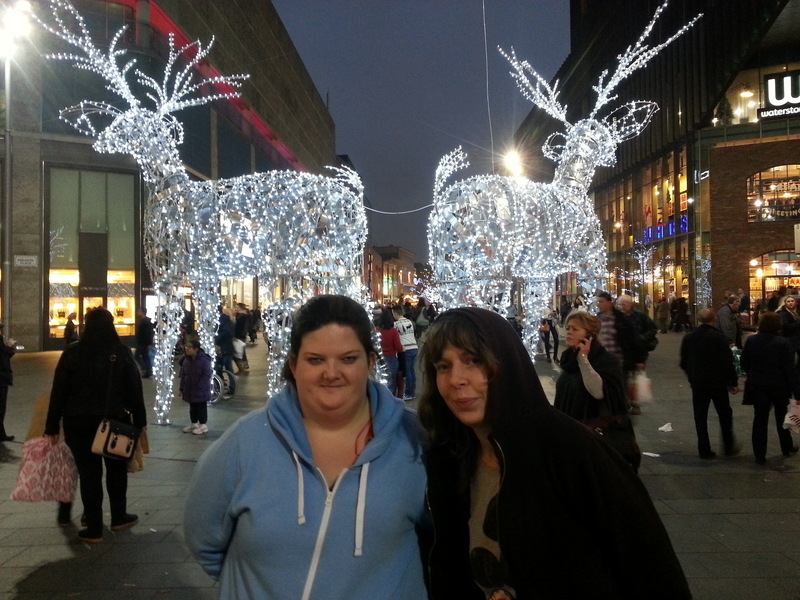 Lost in Liverpool! But we made it by the skin of our teeth to the Bluecoat. Thanks to Dadafest for collaborating with us on this event. We hope to work with them again - their festival is on the alternate year to ours so there could be ways to collaborate in the future. We met Jordan from Young Dada who was in the film ‘Schoolageddon’ which was part of Oska Bright Film Festival 2013. We hope they will send us their new film which is a documentary about their city. We put some changes into action for the VJ workshop and it worked! We think that everyone had a better experience and the feedback certainly seemed that way. People seemed to enjoy different parts of the workshop - some liked the technology and some liked the visual arts bit. We had a really mixed age range, from 4 years old to 44! Some people were challenged by the films we screened today. But we don’t care! It was along way to come and maybe next time it would be good to stay for 2 days and take part in more of the festival. Down the windy roads to Wales we arrived in the lovely countryside in a gorgeous house. Writing this blog in front of a wood-burning stove to keep us warm! We’re looking forward to tomorrow and our first VJ workshop! We drove across the border and over the mountains into Wales and to the new venue of Celf O Gwmpas. It’s an amazing space, welcoming and we were given a tour by Shan, the Director of Celf O Gwmpas. 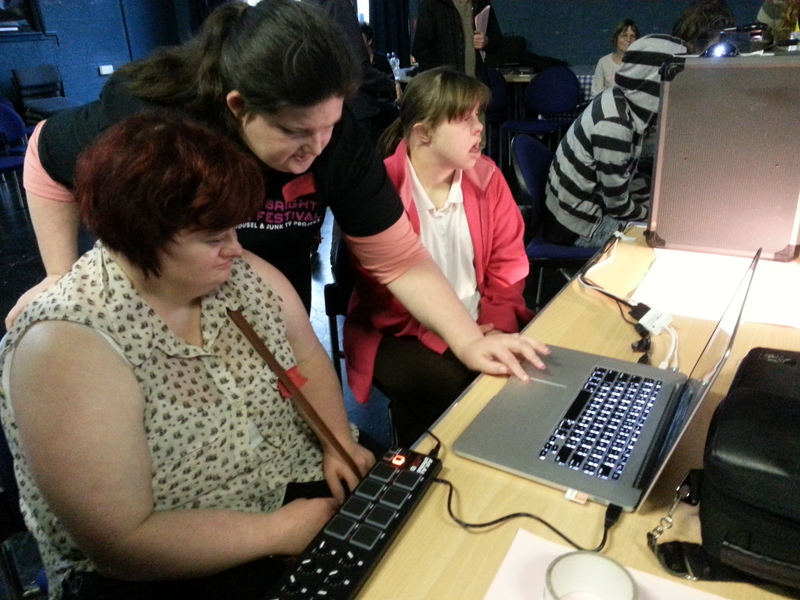 Our very first VJing workshop went down a storm, we had a good mixed audience, with varying abilities. Some of them had travelled for an hour to come. We learned a lot and we have planned how to make the workshop even better next time - we want to use bigger controllers for the VJing and take more variety of art materials. We showed Young People’s Films at the screening and a school who came to the screening showed us their film which they want to enter into Oska Bright. Our day has inspired lots of filmmaking to happen and we are looking forward to receiving lots of films from Wales! The day after our event in Nottingham we travelled through the Derbyshire countryside to the Level Centre, Rowsley. We have met people from The Level Centre before, but we’ve never visited where they are based. It was a cool building, a bit like a space age tin can. We were running our film making workshop, which we’ve changed since we ran it last time. All the people who took part were lovely. Some of them are hoping to make some films for the 2015 festival and hopefully come down to Brighton for it. Whilst we were running the workshop, there was a screening of our films happening next door. It was lovely to hear people laughing at the funny films. We were really pleased lots of people made the trip out to the Level Centre to see the films. We hope that seeing them made people want to have a go at making their own! After we drove back through Chatsworth, we quite fancy moving in, maybe one day. Oska Bright at The Funky Llama Club...it was colourful, it was loud, it was a nightclub.. the fish police played and they were very good! We screened some films and ran a VJ workshop. The film screenings were a bit mixed, sometimes we had very few and sometimes a lot of people. As part of our screening they played the feature film Mission to Lars… It was a very emotional film, I thought it was good. I know it’s real life but I usually tend to like those stories where people go on a journey to achieve their mission. It was a good experience, I’ve been to Italy and Greece but the Plymouth Funky Llama Club was better than both of those places! This was our very first tour event 2014! 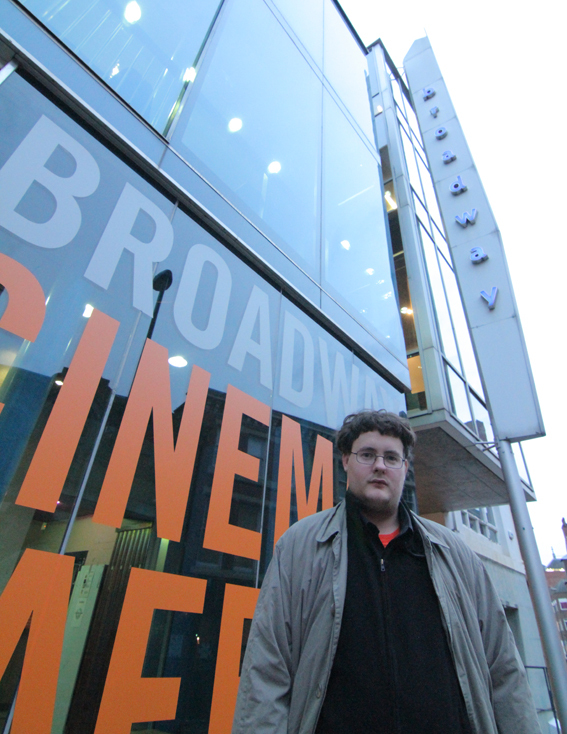 We showed music videos and some dreamy films about people to the friendly audience at the Nottingham Broadway Cinema. The films looked absolutely fantastic in the new cinema package that we put together. We met Isabel from Salamanda Tandem, she was really interested in working with us. We also met Jill from Pulp Friction smoothie bar - she runs a pedal powered cinema, and she might like to hire some of our films. Next we’re off to work with First Movement in Derbyshire. Waay Aye Man!! 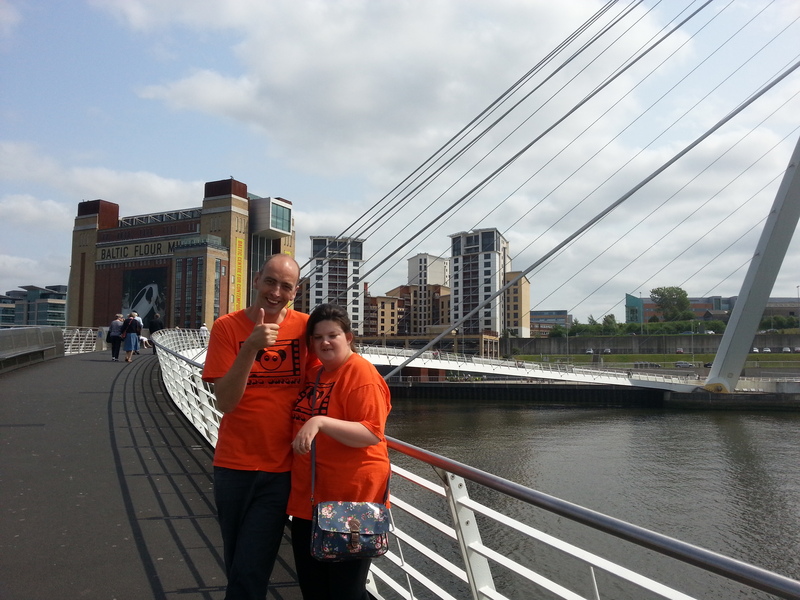 We're in Newcastle! We were welcomed to the fabulous, glamourous Tyneside Cinema by Jonny Tull. We had a coffee in the bar before setting up and running our film screenings. The projection quality was escellent and we had a great audience on the Friday. We talked about if we come back, how we might work with the film-makers in the region. 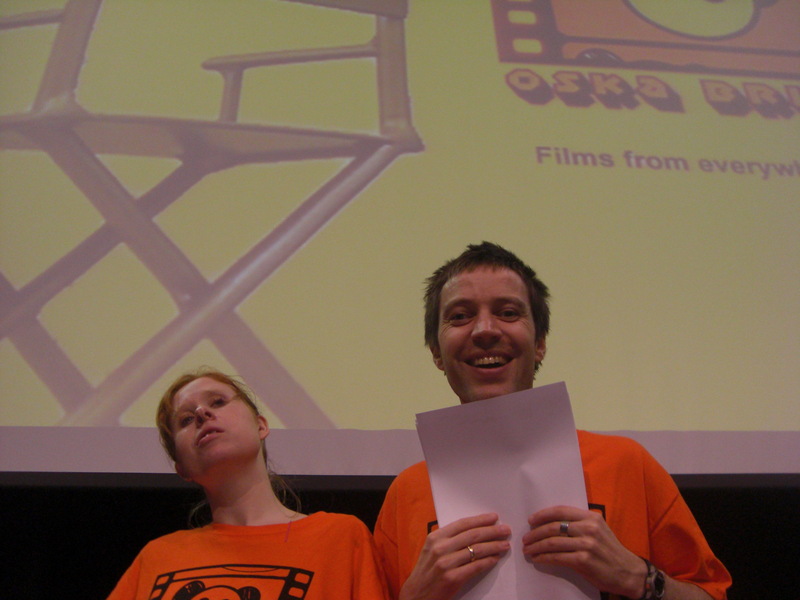 This was the LAST EVER screening of films from Oska Bright 2011! It's been great but we are really looking forward to bringing the new work to audiences on tour. The drama just as we were leaving was that all our bags were locked in a cupboard, and no-one could open it! We waited as long as we could but we had to go in the end. As we write this blog in the buffet car, we wish you all a great summer and see you at the festival on the 17th 18th and 19th of November this year! For more information about the Oska Bright film festival please click on this link. The Arts Centre is a converted church - with a great setup for our visit. It was weird to leave for Salisbury on a Sunday, we stopped off in London to bring out of retirement the champion profiterole-eater and 1 direction fan - Adele King! she says "I found it good to be On The Road again, I felt relaxed about it. I hadn't worked with Becky before and that went very well." The event was good, we got a wide range of reactions from the audience and some people felt challenged by the films - which is good. We had a discussion about how we put together the screenings for future On The Road events. The staff at the venue were fantastic, very welcoming and professional. 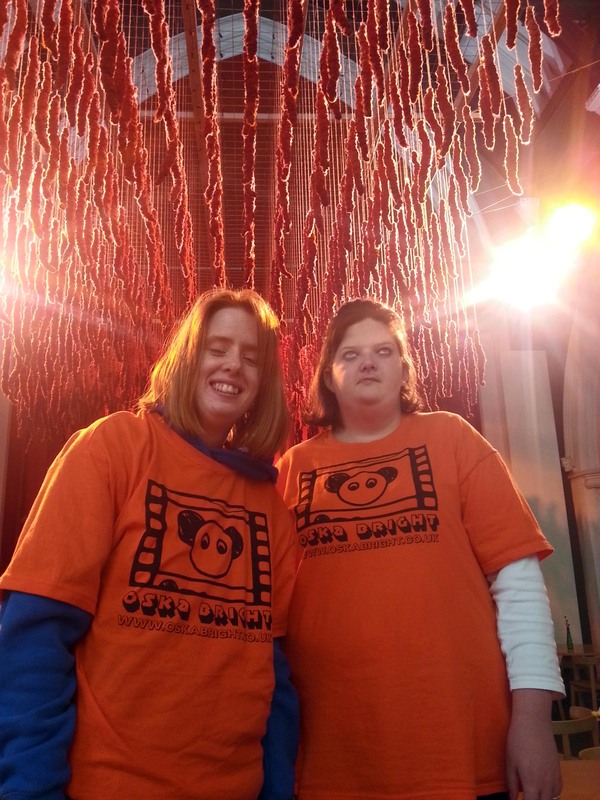 We got the best reactions from learning disability theatre groups. We'd love to go back there and maybe with a film-making workshop - we think that people would really benefit from this. It Rained and-a-half! We left Brighton and we broke down!! Changed the car and after that small detour we were on the road! We would have liked to have met up with Stephen from JUMPcuts in Glastonbury, but unfortunately we were too late and wanted to rest before our screening day. In The morning the sun came out, we arrived at the Engine Room in Bridgwater, it's a great venue and we were made to feel very welcome. We had a brilliant audience including people from Open Storytellers in Frome, 'Sweet Things', Bridgwater College and Somerset Film. We met some new friends and some old friends. It was really good to finally work with JUMPcuts on an event, we enjoyed seeing their new films too. The audience responded well to the films and we had some lively chats about the work. We hope to see some of the audience at Oska Bright this year! The only way is Oska! We came to Hadleigh Old Fire Station in Essex. After going around the Basildon roundabout 6 times and taking photographs of the Basildon 'Hollywood' sign, we checked in and chilled out. We had a nice relaxing dinner - the spicy chips were amazing! The next morning we left our hotel, the hot water wasn't very hot but the lady on the checkout desk said we all smelled lovely anyway! The satnav guided us smoothly into Hadleigh and we arrived at the converted fire station where we were showing some films. We were working in partnership with Castlepoint Association of Voluntary Serfvices, who welcomed us and introduced us to a friendly audience of people from the council, schools, colleges, care providers and NHS people. It was a really good networking opportunity and we met loads of people who are interested in working with us. We got our pictures taken every 5 minutes by local press, and we talked to the people from Castlepoint about how they do their marketing and press. The films went down well and the audience reacted a lot to them. We got some great feedback on our questionnaires. We wished we could have gone to the beach and chilled out afterwards, but we had to head back to Brighton.. We hope we'll be back in the future to work more in Essex. Ta ta for now! Oska Bright at the Picture This...film festival in Canada! Friday morning – 5am, freezing cold and far too early for my liking!! Arrived at the coach station – everything was still dark, the sun began to rise as we reached Heathrow. 12 hours later we arrived in Calgary – Canada! We were met at the airport by Sheryl, the ‘Picture This…film festival’ Director. I was mega-excited to be there. The hotel was right in the middle of the downtown area of Calgary. We went exploring and bought some essentials – coffee and sugar! Woke up to the snow! Today was our day to explore Calgary. The city is on a grid system, with avenues running north to south, and streets running east to west. It is very difficult to get lost –which is good for us! We went up the Calgary tower, 600 metres high, and stood on the glass-floored viewing platform! But that wasn’t the highlight of the day – later that evening was the Picture This…film festival Awards Gala – where we received the most amazing award! I gave a speech, cracked a joke which got a laugh, then went home and crashed! Peter, who works with the festival, kindly offered to drive us and some other film-makers to Banff – which is right in the middle of the Canadian Rocky mountains. 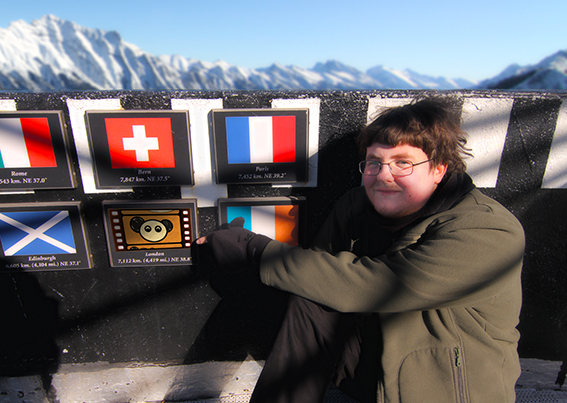 The town was pretty nice, the mountains were amazing- we decided to climb one! After 3 hours of non-stop climbing through the snow, ice and rock (only joking – we took a cable car!) we arrived. The view was exceptional. We all had a brilliant day in Banff. Today was the opening day of the Picture This…film festival and the day that I present the Oska Bright screening. Our screening was at 1pm, it went really well, I followed up with a Q&A session which again went well, there was a University student who was really interested in our festival for her studies, and we also spoke to someone from the Alberta government, who was interested in our work too. We left a load of flyers and business cards and we hope we get more films from Canada! That evening we went out with some film-makers to the lively ‘Kensington’ area of town. We had some food and drinks and on the way back we had a bet about how deep the river was.. which I lost!! 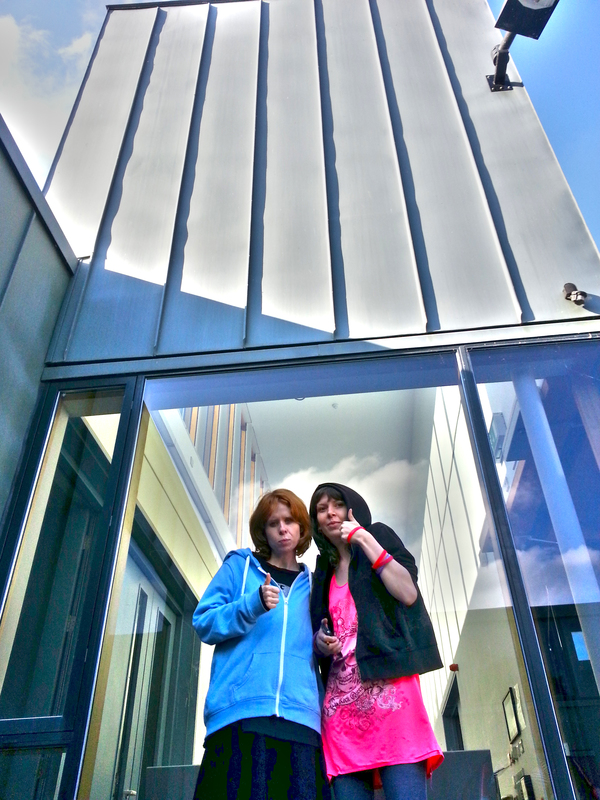 We had a good talk with Sheryl and look forward to welcoming Picture this…film festival to Oska Bright later this year. We got some awesome Picture This…film festival T-shirts. Sadly it was time to leave – I wished we could have stayed longer.. I’m looking forward to the day Oska Bright goes back to Canada – hopefully I might be able to go again! Jason flying solo in Nottingham! Hi everyone, it’s been a very VERY busy week for me! It started on Wednesday at Hove Museum, doing a film shoot for our new project ‘Celebrities On Celluloid’ – straight from there we dropped off and picked up stuff at the office, and then headed off to Nottingham! 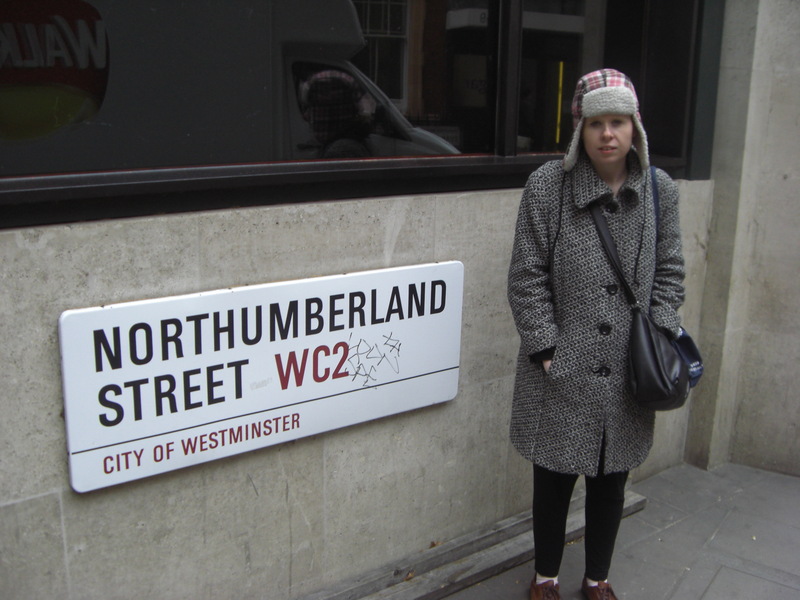 The next day, we got up extra early and got lost roughly 5 times on the way to the cinema. we arrived on time, luckily! and set up for our screenings. The venue was the Broadway Cinema and it was pretty damn good! It was a very good space to meet people and the screening room was spacious and modern. This was my first time on my own and I was extremely nervous, and I didn’t have anyone to fall back on! The audience turnout was great, we had about 100 people watch the films. When it finished I was excited that I’d done a good job and secondly relieved that it was over and I didn’t have to worry about it! We met some good contacts and we really hope to return and show some more great films! Hi it's Sarah and Adele here, this was our first time working together On The Road. 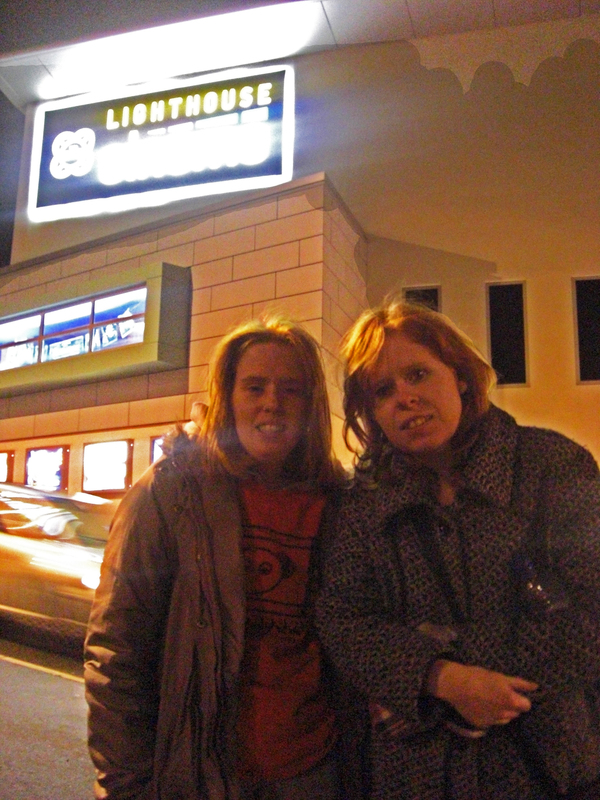 We have been to the Cornwall Film Festival at the Lighthouse Cinema in Newquay. The venue was brilliant, accessible and the staff were friendly and helpful. 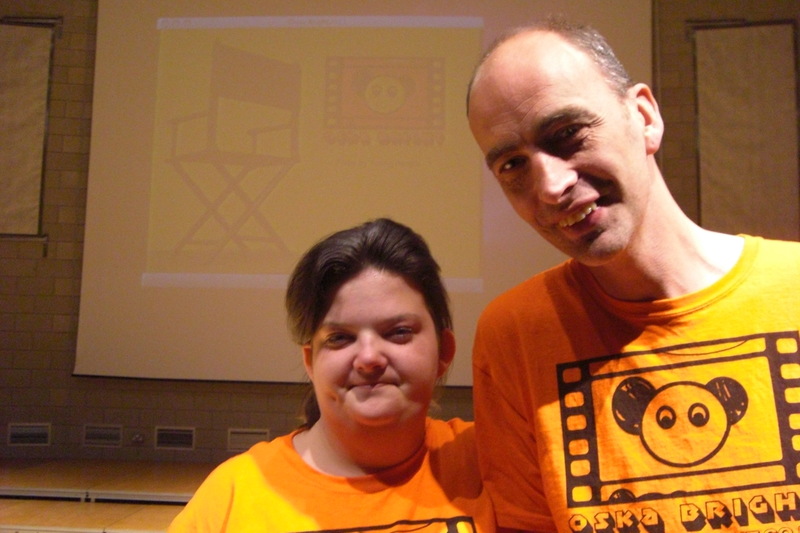 We screened in the afternoon to a mostly non-disabled audience, it went well, it was nice to be in a proper cinema! After our screening we checked out some of the rest of the festival – the animated shorts were brilliant! We did think that the screening was a bit long though, we think our screenings of half an hour are just right. It was great to be part of a film festival with a mainstream audience. 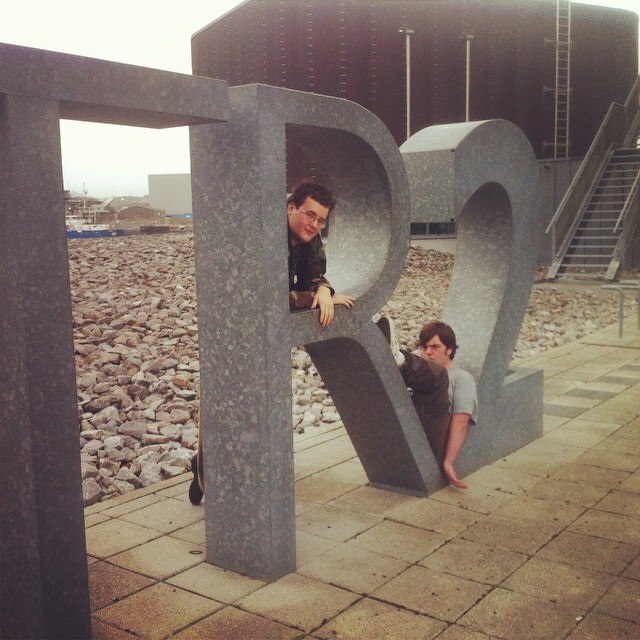 We met some interesting film-makers and we really hope to get more films from Cornwall entered into Oska Bright 2013! We had a long and exciting day at Embrace Arts in Leicester on 1 November. We did 5 screenings in all. Three in the afternoon and in the evening we showed Films in a Foreign Language and Films From Everywhere 1 – all from Oska Bright 2011. Then we did a Question and Answer session. It was fantastic! We met a student doing a case study on disability arts from the University of Leicester who will be writing about Oska Bright. Embrace Arts was a lovely community arts centre – well equipped, accessible and welcoming. We look forward to getting films from here in the East Midlands for Oska Bright 2013. 19th October 2012 By Stephen Firshman and Sarah Watson It was brilliant! It was fun! It was Oska Bright On The Road in Ongar! We saw a film that the guys at Zinc made, which they are going to enter into Oska Bright 2013. We showed them how to use Flip Cams and hopefully they will use them. After we had showed the films, the audience asked us lots of questions. We had a long talk about the films and about film making. We think that we inspired them to make more of their own films and to send them into us. 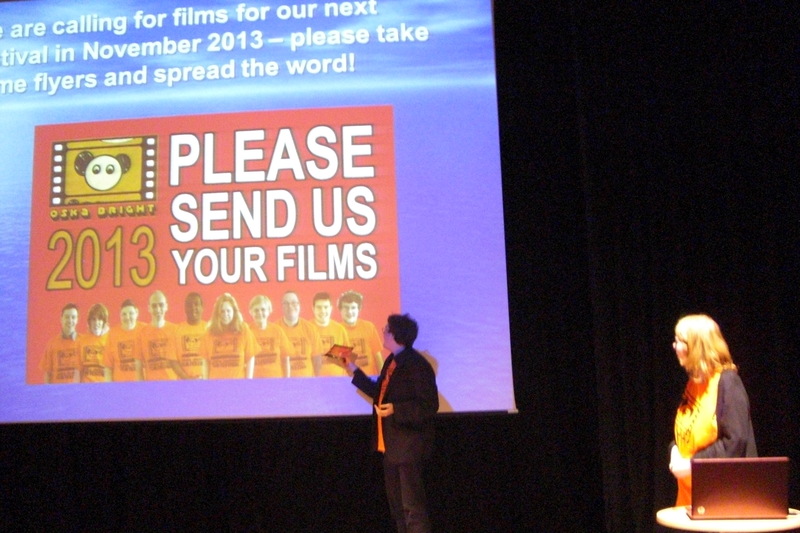 We need more films for Oska Bright 2013 from Essex – please send them in! We arrived at Newbury and checked into our hotel – then we went to check out Newbury Town. It was a quaint and a happening place – yeah! Oh my god! With a lovely variety of charity shops and pubs. This was the first On The Road event this year that was in a day centre – The Phoenix Centre – and we were partnering with Interakt Theatre who are based there. 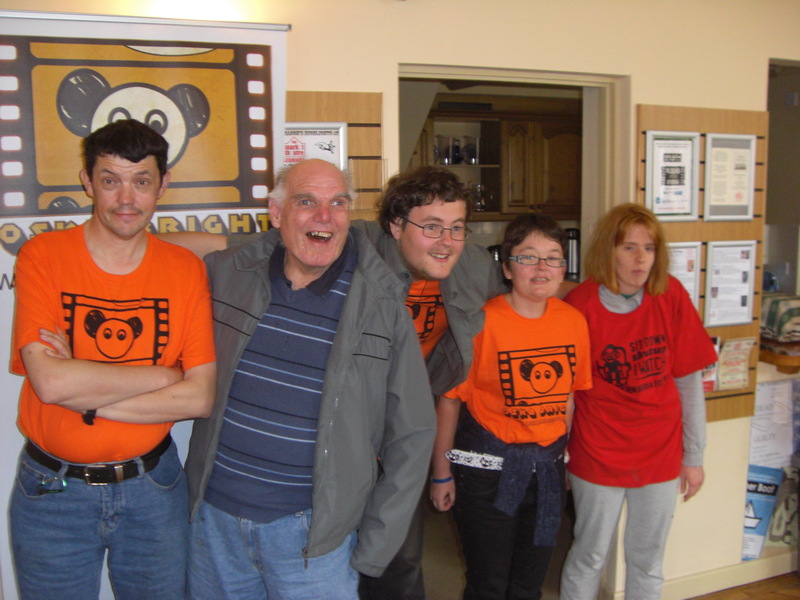 We screened the films in a brand new theatre space that was inside the day centre. It was a great space for watching film and for disabled access. 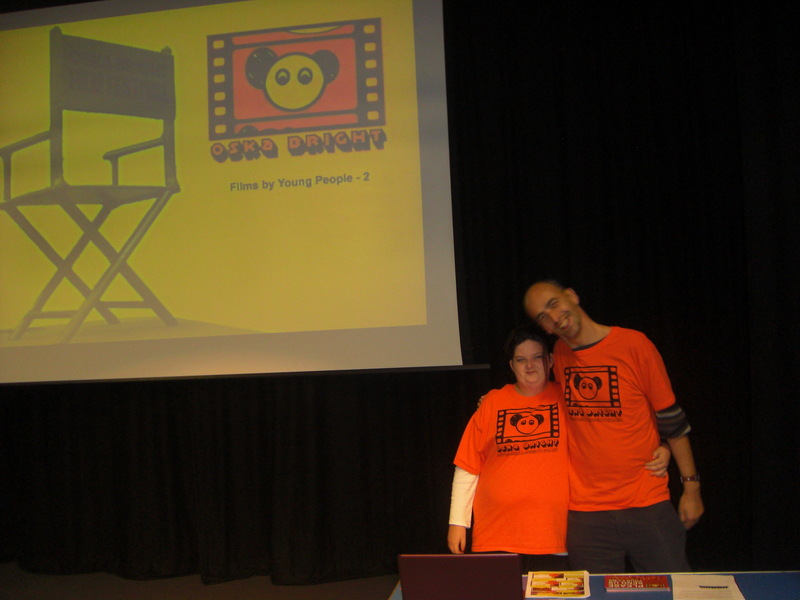 We showed two screenings – films from Australia and Young People 2. We also did our Powerpoint presentation and took questions from the audience. We handed out lots of flyers! The audience were keen and some wanted to make their own films. We hope we’ve inspired them. We are looking forward to getting films for Oska Bright 2013 from Newbury. It was a busy presentation to the Cultural Cinema Exhibition Course in Trafalgar Square today. It was Chaired by David Sin, the course leader and on the panel with me was Caroline Hennigan, Programme Director from Broadway in Nottingham. I made a short presentation about Oska Bright – what we do, where we’re from and why Oska Bright is so important. Then I showed “Unusual Journey” from Oska Bright 2007. After that Caroline did her presentation. Then we both did a joint Question and Answer session. I had a few interesting questions. I asked the audience if they had any questions about Oska Bright – I told them I wouldn’t bite them! I met some people from different film organisations – like the British Film Institute (BFI), Signals Media Arts Centre in Colchester, The Curzon Community Cinema in Clevedon and Flipside Youth Film Festival at the BFI. We swapped cards. I think that some people on the course learned a lot about Oska Bright. I hope to work with some of them as part of Oska Bright On The Road in the future. We arrived at The Market Theatre. It was a basic space – but the projector and DVD player were great! It was hard to present the films because all of the lights were shining in our eyes whilst we were talking. 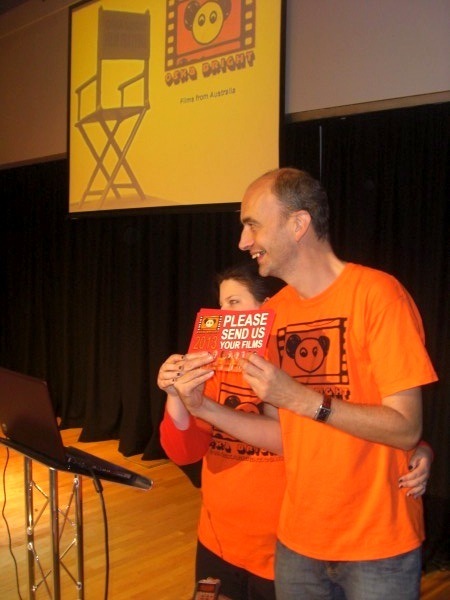 The audience gradually warmed to us, and by the end we had given out a whole load of Calling for Submissions Flyers – we hope to get some films for Oska Bright 2013 from Ledbury! And we lost a battery down the backseat seatbelt of the car after we tried to take a photo of the Theatre ghost! 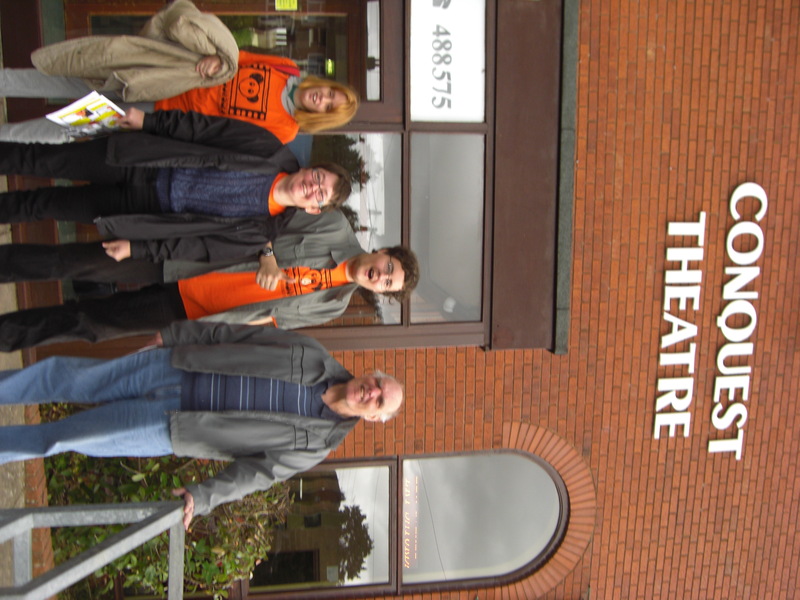 We arrived early and got a very warm reception at the Bromyard Conquest Theatre. We set up our equipment and were lucky enough to get an awesome tour of the building – projector room, dressing room, props and costumes – it was like the Tardis! We had a super interested audience and the Question and Answer session went a lot more smoothly. We got lots of thanks at the end from our audience before we said goodbye. Today we had a very nervous start. We eat a lot of cereal and found ourselves eating it with a fork by mistake! We travelled to the Courtyard Theatre in Hereford to present two screenings, a presentation and a Question and Answer Session. It was Adele’s first time On The Road, and Jason says that even though she was a little shy, she performed admirably! The Question and Answer session was hard because we couldn’t hear everyone plus they asked some very tricky questions. But we did well, pulled through, and had a nice coffee afterwards. 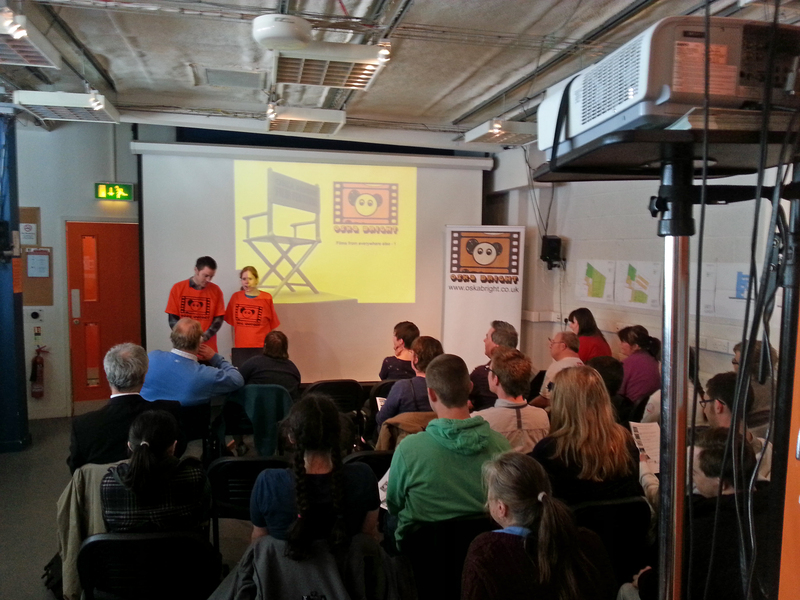 We think that the audience members were into film making and showed a lot of interest in next year’s Oska Bright Film Festival – we look forward to getting films from Hereford for 2013! Many thanks, too, to the four Committee members from Wye Valley NHS Trust who were so welcoming and helpful. They really helped us out with our massive audience! It was really good! All of the staff and the lovely audience at the Wilshire Music Centre were really warm and welcoming. It was a lovely venue! We hope that the Oska Bright films have inspired all of the people who saw the films. They’ve told us how much they want to make their own – they already use Flip Cams so they’re half way there. We showed “Films By Young People – Screenings 1 and 2” from Oska Bright 2011. The audience really liked “The Pirate and The Mermaid”, “Staying Safe”, “Teeth the Musical” and “History in Motion”. Goodbye Bradford-on-Avon – we look forward to seeing some of you at Oska Bright 2013! We set off to Bradford to visit Mind The Gap Studios and show some Oska Bright films. It was a very damp day and the motorways were misty with rain – so we watched “Underworld Revolution” in the back of the car. 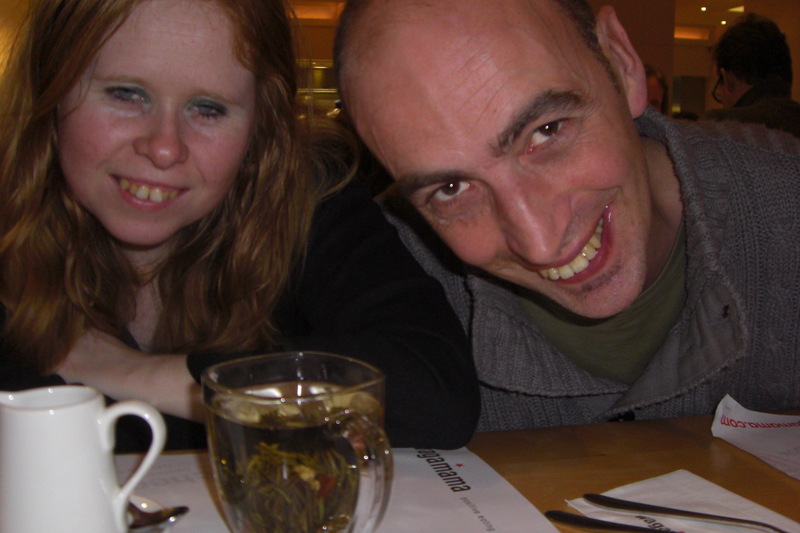 After about six and a half hours we arrived in Bradford and had a really nice Indian meal – and discovered Indian tea! Then we arrived at the Studios. We met Dave the technician and lots of other staff. We set up and then had a practice of introducing the films and our presentation, checking our scripts were OK.
We started showing films at 6.30 pm with “Films from Everywhere – Screening 1”. Then we had a quick break where we all had cake that Charli had made. The cake was lovely and light – thank you, Charli! Fifteen minutes later we came back to show, “Films from Everywhere – Screening 2”, followed by another break. Altogether we did six interviews on our Flip Cam with audience members about what they thought of Oska Bright On The Road. People said that they were very impressed with Oska Bright and what we are doing. Then onto our final screening, “Films by Young People – Screening 2”. These films went down really well. After this, we tried to show the film that some of the audience members had made in their film making workshop before we started screening – but it wouldn’t work! Hey-ho. So we carried on with our Oska Bright presentation and had a Question and Answer session. There were some very good questions. One of the films provoked lots of discussion around discrimination. The film, “Best Interest” made people sad because some people aren’t “allowed” to have relationships with one another. We really enjoyed Oska Bright On The Road Bradford and we are looking forward to the films that some of the audience members will be sending in to Oska Bright 2013. 15th and 16th March 2012 By Matthew Hellett and Sarah Watson The Conference began on Thursday the 15th March at 11 am with a great beginning session – everyone together doing stuff – we made paper planes and then threw them at each other! Then we grabbed a quick coffee and went straight upstairs to the screening room. Everyone sat on bean bags on the floor to watch the films – some people sat on chairs at the back, too. Everybody said how good the bean bags were – they felt more relaxed! We showed “2011 Films From Everywhere Else Screenings 1 and 2”. It was a great vibe – really full up – we couldn’t move! We felt like baked beans in a baked bean tin – it was very good! Then we went and gave a presentation about how we market Oska Bright with a Question and Answer Session afterwards. It was great but we needed more time for the discussions. We started to talk about quality in our work and how we can get more venues and people to see what everyone is doing. 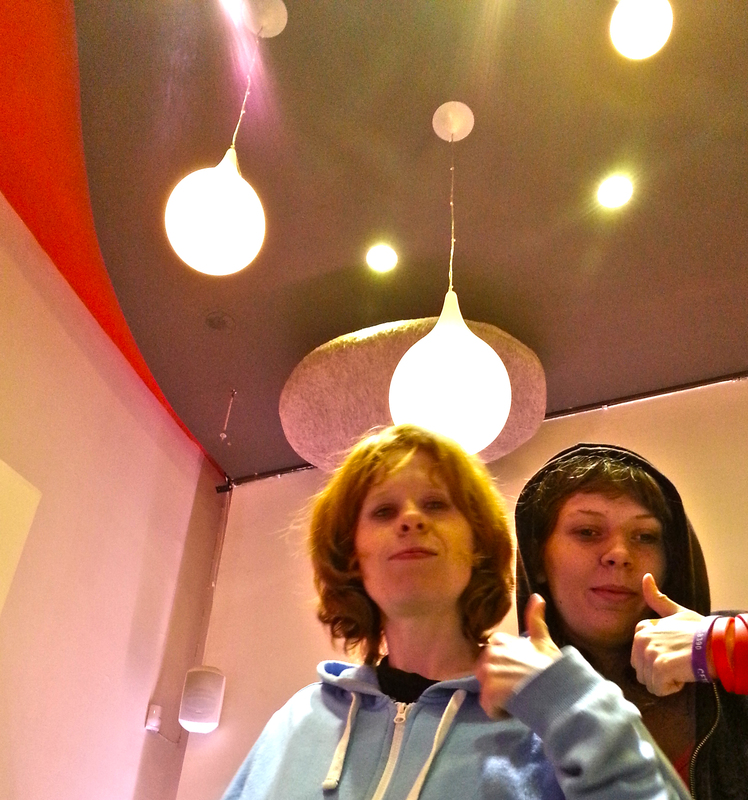 We know that work by learning disabled people is so fabulous and that it needs to be seen by more people. The next day (Friday) we got up bright and early and got tickets for the workshops we wanted to go to. We went and presented “2011 Films from Australia” and “2011 Films in a Foreign Language”. We got great feedback from the audience! After we’d done this we went across the road to see the Bamboozle installation in a great big tent. Then we went to the First Movement Mobile Studio and had a go at moving with their digital arts camera’s and computer programmes. Matthew wouldn’t leave the studio and got an extra go! We hope that we can work with them to make a Digital Art Installation for Oska Bright 2013. Watch this space. We presented our ending thoughts to the whole Conference. Overall it was a great Conference – we met loads of interesting people. Our great hope is that we can all stay in touch and keep talking about how we can get more people to appreciate the quality of learning disability led arts and culture. We look forward to the future and hope it is orange like our Oska Bright T-Shirts! We just had a lovely meeting with Iris Ambor and Lark Bieberfrom the Embassy of Israel. They are the Counsellor for Cultural Affairs and the Cultural Affairs Officer and they want to see if they can work with us to see if we can bring Oska Bright to Israel. Once we were in the Embassy it was really nice – they had lovely, beautiful chandaliers! It was an amazing building. We have never been to an Embassy before. Getting in was a whole new experience – we had to go through lots of security checks and we had to explain about everything that was in our bags. We know that they had to do it for their security. At the meeting we did a presentation about Oska Bright and Iris and Lark asked questions about who our audience was, who our partners are around the world and how we work together with them. The meeting was really positive, and Iris and Lark made us feel very relaxed. We feel positive and excited about bringing Oska Bright to Israel – watch this space! We found the University in Newport very hard to find – the sign for it was so small! It was a big building, and it was hard to find our way around the inside, too. But when we met with the Cinovate staff they were very friendly and welcoming. We were part of a Panel Discussion during the morning. We met the people on the Panel with us – there was Rachel Castell who talked about “Support Your Local Cinema” and Jonathan Caouette, an American film maker. The Chair was James Mulligan from Cinelan. My presentation was 2nd – I’d made a Poerpoint to help me – and I showed the film “Unusual Journey” by Matthew Hellett from Oska Bright 2007. It seemed to go down very well. There were some questions straight away, and a discussion. I’ve done a few presentations and Question and Answer sessions now, and I’m getting more confident at it. I really enjoyed being part of this panel. 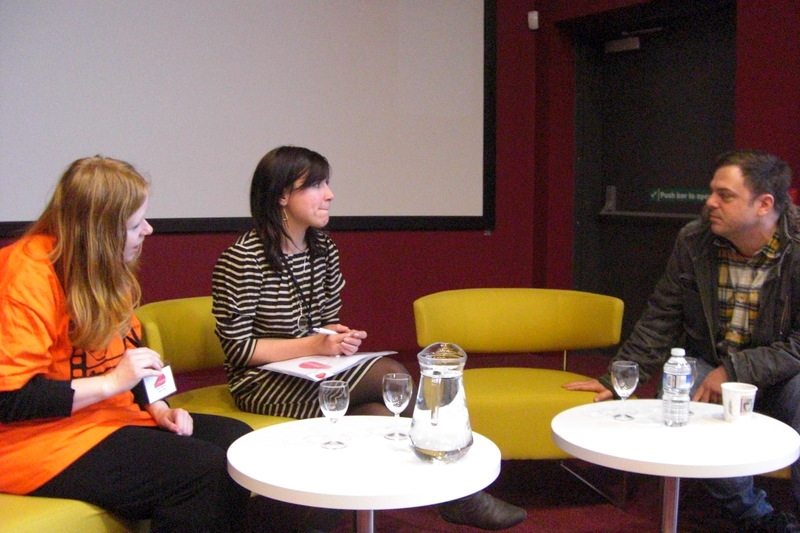 We talked to Zoom and two students from University of Wales who want to work with learning disabled film makers. We talked about coming back to train them and being part of their March 2013 Festival – I hope it happens! We hope we can work with Disability Arts Cymru on that, too! It was an honour to be part of Cinovate 2012 – we hope to keep on working with them and come back soon. Thanks to Hannah for organising everything with us. Happy New Year to you, we hope 2012 is really good for you! It’s Sarah and Matthew here from the Oska Bright Committee – we have some exciting news for you. 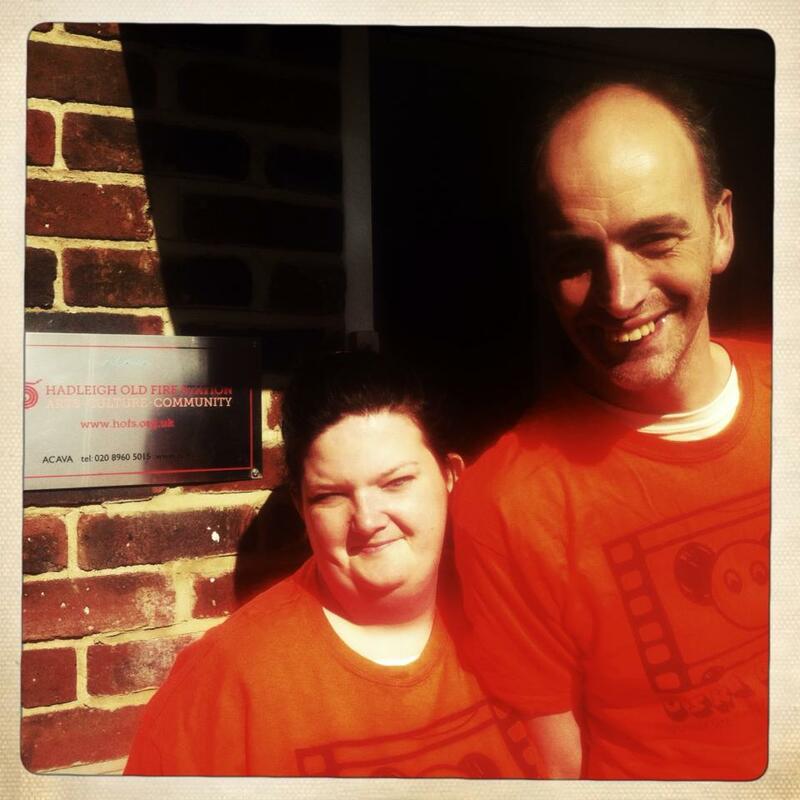 Over the last year we have been making films with young people with a learning disability, and by March 2012 we will have made 5 new films – phew! They will all be shown as part of “Gold Run” – a new multi-media show that Carousel is putting on in partnership with Glyndebourne and Pallant House Gallery. The show is about learning disabled athletes. It celebrates their return to the Paralympic Games at London 2012 after years of being banned. 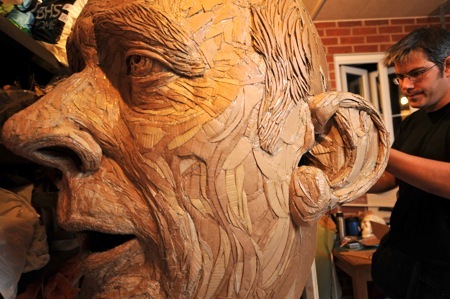 “Gold Run” has our films, a new choir of learning disabled young people singing live with David Rushbrook – an opera singer with a learning disability from Dagenham, and a giant head made by sculptor James Lake! The show is set in a sports stadium where a Sports Coach is training up a new bunch of Paralympic Athletes. They sing about their dreams and the things that stop them from making their dreams happen. James Redwood from Glyndebourne has written some new music and the choir and David have written all of the words.